Various students’ organizations and women folk bodies continued to intensify protest against the Citizenship (Amendment) Bill, 2016 in Manipur. Meanwhile, representatives of six student’s bodies – All Manipur Students’ Union(AMSU), Manipuri Students’ Federation, Democratic Students’ Alliance of Manipur, Students’ Union of Kangleipak, Kangleipak Students’ Association and Apunba Ereipakki Maheiroi Sinpang Lup in Manipur said that a team of students from the state will join a demonstration against Bill in the national capital on January 30 next. President Manjit Sarangthem of AMSU said they will be leaving the state soon for the New Delhi. On the other hand, the Socialist Students Union of Manipur, All Manipur Muslim Students’ Organization, Manipur Students’ Association Delhi and Reformist Students Union of Manipur have announced that they will be launching intense form of agitation if the Bill is passed in the Rajya Sabha. Earlier the college students’ unions in Manipur resolved not to participate in the Republic Day celebration on January 26 in protest against the Bill. Representatives of college students’ unions also appealed to the people of Manipur and the Northeast to unite and work collectively against the Bill. 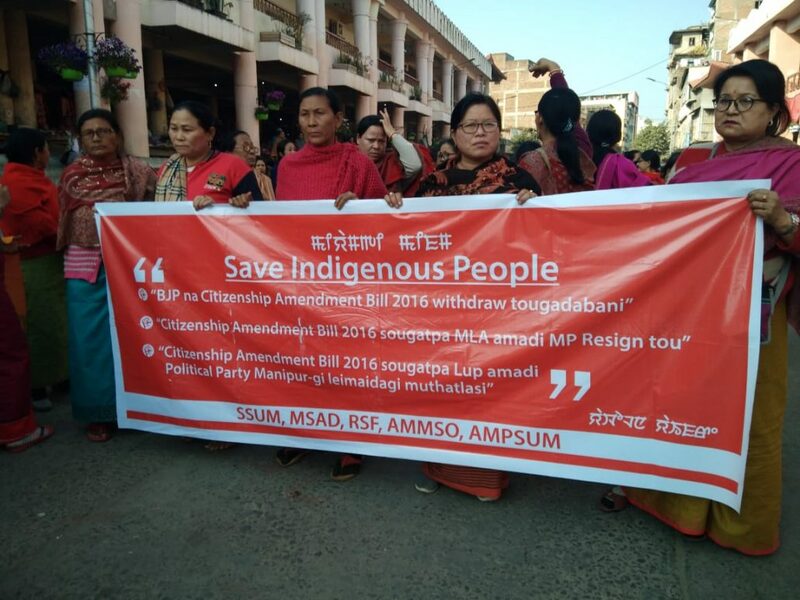 On Thursday afternoon, a group of students and women folk tried to march towards the residence of Rajya Sabha MP Kh Bhabananda at Keishampat Thokchom Leikai in Imphal along Wahengbam Leikai road to submit a memorandum. But they were prevented and in the follow-up police action, four students reportedly fainted. But the police team evacuated them to hospital to give first aid and treatment. The students and women folk urged the MP to make his stand clear to the public at the capacity of being the president of state unit of BJP as well as Rajya Sabha MP. A student leader after submitting the memorandum told the reporters that the Rajya Sabha MP after listening to their demand assured that he will work considering the sentiment of the people. It may be mentioned that Manipur Chief Minister N Biren Singh has called an all political parties meeting to discuss about the issue of Citizenship (Amendment) Bill 2016 and other related issues in Imphal on January 28.